On 28 March 2013 a statue of the legendary footballer Ferenc Puskás is being unveiled in Óbuda in Budapest. This is the first full-figure outdoor statue of him. 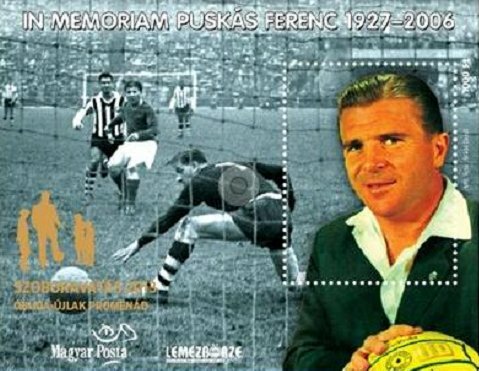 To mark this occasion, Magyar Posta and Lemezbörze,...plusz magazine are releasing one thousand copies of a special version of the commemorative sheet In memoriam Ferenc Puskás, jointly issued in 2007. The silhouette of the group of figures comprising the statue, and the date and place of the unveiling are overprinted in gold leaf. The commemorative card for the commemorative sheet has a description in Hungarian, English and Spanish. 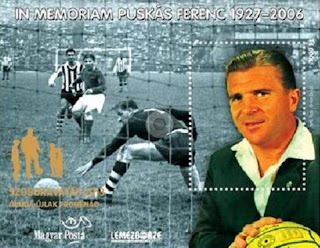 Ferenc Puskás, the legendary footballer was affectionately known as “Öcsi”, meaning Buster, by Hungarians. He played for Kispest AC, which later became the Hungarian army team Budapest Honvéd FC, the Hungarian national team and Real Madrid, and then became a successful trainer at Panathinaikos. During his career he taught young people all over the world to respect football, setting an example for several generations. It is no coincidence that the group of figures comprising the statue made in his honour, which was inspired by a photograph, unusually depicts a street scene showing him teaching children how to control the ball. The sculpture, which has no pedestal, is on the Óbuda-Újlak promenade, and is the first full-figure statue of Puskás in the world. The work is the legacy of the sculptor Gyula Pauer, and the figures of the children were made by the sculptor Dávid Tóth.